In yesterday’s saintly action, Ignatius of Loyola closed the door on Marina the Monk 60% to 40%, paving the way to the Elate Eight. He’ll face the winner of Gobnait vs. Paula of Rome in the next round. Today John Chrysostom squares off against Ephrem of Nisibis, as bishop meets deacon for a shot at the Elate Eight. Will the Golden Mouthed prevail over the Harp of the Holy Spirit? Well, that’s up to you. In case you missed yesterday’s exciting episode of Monday Madness, you can watch it here. Tim and Scott dove headlong into the giant sack of viewer mail, plugged books, and reminded everyone on April Fools’ Day, what it means to live as a Fool for Christ — not by anything they actually said, mind you. Oh, and if you actually did neglect to watch Monday Madness, you should head on over to the virtual purple confessional. John Chrysostom, the “golden mouthed,” is remembered for his stirring oratory. His sermons in many ways speak to a context similar to where we find ourselves today. Antioch was a prosperous city with a fantastic agora that gave people access to just about anything that one could desire. Those who were wealthy made ostentatious displays of their largesse. Philanthropy was a means to improve their social standing. John spoke boldly into that context encouraging his congregants to give particular attention to those who were poor and vulnerable. His concern for those who were poor and vulnerable was not limited to his sermonizing. 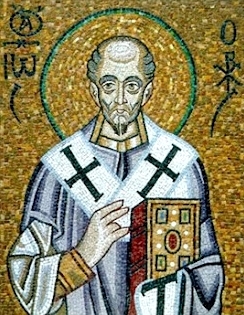 When he was elevated to the Patriarch of Constantinople he cut the Bishop’s household budget and used the funds to support one of the hospitals. He also commissioned a leper colony to be constructed just outside the city. Nearly immediately after his exile, construction on the colony ceased. Ephrem of Nisibis was known as “the Harp of the Spirit,” likely referring to the way he wrote religious poetry that conveyed the power and truth of the Christian message. This knack for writing and poetry can be seen in his Hymns against Heresies. In a time when the early Church was wrestling with what were the fundamentals of Christian truth (amid a swirling context of competing, often contradictory claims), the early councils of the Church were instrumental in discerning the foundational claims of the nascent Christian faith. To stamp a penny with his image. He is either burned or cut off. Stamped the image of himself instead of [that of] our Lord! Response: Blessed is the one who stamps us with his name! Our savior stamps his beauty. Because he despises the living name. For Ephrem, to be stamped with the image of Christ was a “beautiful” thing. He might have a lot to say about a complicated denominational structure that prompts us to refer to ourselves as Episcopalians, or Lutherans, or Baptists before we refer to ourselves as Christians. Ephrem of Nisibis: 16th-century Russian illustration, unknown. Public domain. 101 Comments to "John Chrysostom vs. Ephrem of Nisibis"
I say of Chrysostom: rysostom. So you’re agin’ him, eh? Voting against Chrys more than for Effie? This was your best verse yet! Rysostom! Love it! I voted for Efrem, how could I resist the the “Harp of the Spirit”, but it’s not looking good for him. Sorry, I know it’s confusing. In brackets which were made by Scott and Tim. That doesn’t seem very penitent, guys! I didn’t say it was penitent! But all the cool kids do it! Did ya know Chrysostom means “Golden Tongued”? John wrote a killer sermon. He spoke out bluntly to those in power. How he left them squirmin’! A ruling that John later ignored! Represents a saint’s added reward. Golden Halo as an added reward? What’s that, some kind of Episcopal concept? A golden prize that saints strive for. That IS Episcopalian. ‘Cause things would not get pretty. Giving them a role in the church! Seems a lock when you do the research. Eph dies helping famished eat? John croaks in the desert heat! Aid the poor’s his fav’rite scene! …to make it to the Elate Eight! We all want to be ‘em. Through them, our faith survives. Who will win today’s election by majority? Who will advance to Elate Eight? Cap-G – O – L – D – E – N – space – Cap-H – A – L – O! I didn’t know “Avenue Q” it all, so it was fun to play it on YouTube and sing your words. Hilarious. I cannot imagine how you do this day after day, but I’m so glad you do, Michael! I did that, too, I wasn’t familiar with it at all. Michael, I am so impressed by your encyclopedic knowledge of show tunes! I’m gay. It’s in my DNA! This is where this song began. I have been waiting for the right saints to attach it to. Stamped as Christian! Not as a denomination. I don’t feel like today’s blog did Ephrem any favors. I had to go back to the original one to remember why I voted for him the first time. This round is about Quirks & Quotes, so in regards to the Saints one knows less, it is not uncommon to have to re-read the first round posts to assist in recalling the biographical details of those Saints. Ephrem for me! Ilike Ephrem and voted for him in the last round. None-the-less it would have been Anybdy But Chrysostom, the Jew hater and woman hater. “Women have no souls” indeed! Where does this idea come from, that Chrysostom said women have no souls? You put it in quotes but I don’t think it’s actually something the “golden-mouthed” ever said. As I read the blogs, I found myself leaning toward Ephrem the poet, in honor of the outstanding poetry, prose, and parody in this year’s blogs and comments. Any Lenten discipline that replaces Schadenfreude with a Golden Halo makes everybody a winner. “Countless poor people have to go hungry so that you can wear a single ruby.” How relevant that statement is today. I voted for Ephrem. He instituted choirs of women to sing his hymns. Without choir, church would be a so much less rich experience for me. The greatest teachers of public discourse have always argued that eloquence was not enough. What matters was that the eloquent person use that gift for the highest possible purposes. These teachings were well known long before Jesus was born. There are times when the one called Golden Mouth met those standards. However he betrayed the trust given to him with his oratorical gifts when he misused them to brutally attack Jesus’ own people, the Jews. I do not accept arguments that this was simply the attitude of the day. He did not open his heart. He did not seek the Spirit’s Wisdom with openness and vulnerability. Had he done so, he could not have produced a series of “sermons” which, even today, are unsurpassed for their attack on our Jewish kindred. The deacon, Ephrem, by contrast, in his use of his talents, dealt with specific, clear points of disagreement, and did not taint an entire people with his arguments against individuals. He honored his called as a deacon in service to the poor, as a poet and hymnodist and, above all, as a Christian with a deep passion that the Word of Christ be sung out with joy, wonder and thanksgiving. On top of all that, it’s about time that a deacon won the Golden Halo. For Ephrem the Deacon, give thanks! In service to Christ he was frank. For grace, hope and love highly ranked. If we had a “Like” button, I’d be giving this a “Love”! I agree that it would be nice to see a Deacon win the Golden Halo and Ephrem has my vote, but I strongly suspect a certain very well known December-fêted Bishop will probably end up obtaining the Golden Halo. Hear hear! Exactly! Vote for Ephrem! Thank you, Diana, for sharing this additional information and opinion. Based on the writings offered for this bracket, the decision was difficult. Chystostom’s urgeings centered around one of the more important aspects of Jesus’ teachings – that of justice, in the form of caring for others. Ephrem brought attention to the error (sin?) of evangelizing to improve one’s own standing, rather than for the work of the Lord. Such seeking of power in Jesus’ name has injured His body and the world at large. As our society still holds power/wealth, in higher esteem than righteousness and Love, Ephrem’s message is more needed in our time and space. Thus, he has already recieved my vote. Ephrem! My vote is not just for him but against John. Thanks to comments by LM community and a review of the original posts, the choice for Ephrem is clear, despite John’s present lead. I love poets and what they bring to the imagination; but I voted for Chrysostom because of his emphasis of aiding the poor. Hard choice to make today. Ephrem it is for our vote today! While I love the title, “Hymns Against Heresies,” Chrysostom speaks to our day as well as to his own, and his concern for the poor and for wealth inequality is much needed in our world today. Elaine, apropos of nothing, I just realized in your photo you’re holding a coffee cup. All these years, I thought it was a camera with a big lens! Time to go back to the opthamologist! I too thought it was a camera. John’s anti-semitism and homophobia is enough to overshadow his concern for the poor. He may have had a golden tongue but I guess it never occurred to him consider the ethnic & religious background of Jesus, not to mention His mother, the 12, Saint Paul, Saint Stephen, et cetera . . . . I am going with the saint less heralded in Western Christendom, who wrote in the Syriac/Aramean, close to Jesus’ own Aramaic. He lived in brutal and chaotic times and responded with poetry and verse to all the competing claims of other religions and the many Christian sects. His writing is evidence of the great diversity among the followers of Jesus. I’m casting my vote for Ephrem because he so beautifully modelled Christ. Chrysostom’s oratory was “stirring,” all right. After New Zealand, do we need any *more* proof of the power of speech cankered with hatred? Chrysostom preached that Jews were “fit for slaughter.” He preached that homosexual men should be stoned to death. He also wrote a beautiful sermon and inspiring prayer—so what? Richard Wagner created the most inspiring and profound music-dramas imaginable, and no one’s ever claimed *he* was a saint. Add in Chrysostom’s scorn for women, and I wonder why this man is even in the bracket. He is no saint for our times. I fervently hope that multi-cultural, women-respecting Ephrem will take John False-Gold down. I’m handling today’s match-up like the they judge the knock-out rounds on the Voice: based on today’s performance (the write-ups)….. the winner is Ephrem. His blogger shined a light on his value during the formative stages of Christiandom. That meant a lot to me. Hard choice today. John’s emphasis on the poor spoke to me. But Ephrem’s poetry wins the day. I vote for the poet. I am especially interested in the idea of Christ’s image stamped in the people. People are the wealth. I read Nadia Bolz-Weber’s Shameless recently; in it she rebukes Tertullian for saying that women rubbed out the image of God in men. She says the imago dei cannot be rubbed away as the image of Caesar can from actual coins. The image of Christ stamped in each human is imperishable. She too speaks of heresy and cites Friedrich Schleiermacher, the 19th-century theologian, as saying that preserving the appearance of Christianity over its essence, of loving one’s neighbor, is heresy. Let women sing in choirs. Feed the poor. Welcome immigrants. Protect the earth. Establish a non-fetishistic court system that interprets the constitution according to living concepts of freedom and not according to the dry-as-dung notions of wannabe contemporary slaveholders and rentiers for whom “freedom” means orgiastic profit. Sorry, it’s the deacons’ job to point out heresy. It sounds better in verse. For me, not the most inspiring matchup although, as always, my first and best morning read. I voted for John as my historical intuition tells me Ephrem’s preoccupation with heretics probably was a little less Christ-like considering the social norms of the era. Quite accidentally, I stumbled across a potential nominee for next year, Giovanni Borromeo, an Italian physician in Rome during the Second World War. Wikipedia K Syndrome or the short article in the British publication History Today, March 2019 if you please. Oh, and good morning to all. There is also a Wikipedia article under Dr. Borromeo’s name. I see Giovanni Borromeo is recognized as “righteous among the nations,” unlike those of his times who would have agreed with John C.’s sermons against the Jews. You bring up an interesting question: how to assess individual thinkers’ motivations from a historical perspective? I don’t actually know how to judge either of these men. To what extent were they motivated by piety and Christ-like fervor and to what extent by hate or bigotry? I don’t know. I think we are still in the process of trying to figure out what “Christ-like” means and applying it backward. I know from having read so many discussions on LM that the marginalized figures are worth reconsideration. I am trying to expand my notion of what a “saint” means and how that might be a viable category for a faithful life today. It’s a struggle, one best done in a supportive community. This small virtual community provides just such a supportive environment. I do think the category of “heresy” might be a fruitful tool with which to face our unjust society today. Yes to all this. Thank you. Thank you for your thoughtful comment. Historical perspective and behaviour relative to the period is a perpetual dilemma. John Chrysostom loved the poor, encouraging us to see Christ in everyone we met, but most of all in the poor, the vulnerable, the foreign er. Ephrem’s hymns defended truths by bashing opponents of the orthodox faith; for me, they condemn without captivating (to paraphrase Emily Dickinson). John Chrysostom, hands down this time, for his wise advice about giving. I especially like his statement that giving should be an everyday thing, like washing our hands. With God’s help (and I’ll need it!) I’ll try to keep this in mind from now on. It’s interesting to me that, so often, reading the comments would lead one to predict a very different outcome of voting than is actually the case. Do the people in favor of the one who soars ahead not feel a need to talk about their choice, while the ones favoring the one behind want to share the reasons for their vote and encourage others to join them? 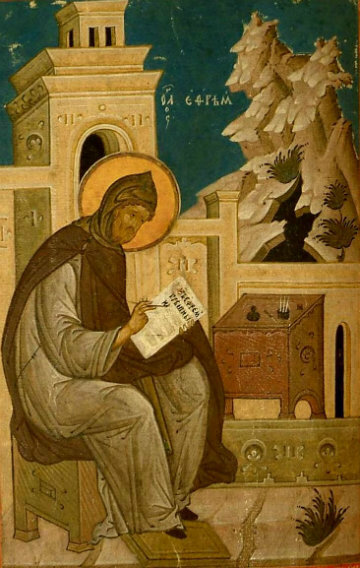 64% of the comments as I write this one are in favor of Ephrem, and John Chrysostom is ahead 76% to 24%. I’ve never known a lead that wide to be overturned in Lent Madness, but I would be glad to see it happen today. Both men were concerned about the poor and right doctrine. Ephrem organized choirs of women and John Chrysostom used his eloquence, among other things, to promulgate hatred for women and Jews. How can there be a choice other than Ephrem? “Quality of discernment”? Really? Sorry, avid participant [I have three churches playing now] but until this, I’ve never commented. I’m trying really hard to not be offended. Grace to all. Is this to me? I should clarify that I’m not disparaging other people’s votes. Nor am I saying that people aren’t thoughtful. I am commenting on Kathy’s observation that there seems often to be a wide gap between the actual vote counts and the commentary, which veers in a different direction. The image I had in mind was the crowds around Jesus and the disciples, who quarreled among themselves (and were often wrong). All were seeking enlightenment. By “quality,” I was referring to the nature of the discernment, not its value. Some of us sift through the commentaries and filter our thinking through them; others don’t. I’m not judging, merely analyzing. Also, just FYI, if your moniker is “Great Unwashed,” are you being ironic? Because such a moniker seems to undercut your claim to being offended, if you see what I’m saying. I’m genuinely inquiring. Grace back at you. Oh, dear, I’m afraid I’m guilty of nonengagement today, and yesterday as well. I’ll try to bear down on the thread tomorrow. Being six hours ahead the US is affecting my already fragile concentration, and tomorrow at 8 am EDT I’ll be in the middle of a six-hour drive from Eisenach south to the shores of Lake Constance. I think people who don’t read the comments or just read a few wouldn’t be aware of John’s antisemitism and misogyny. They’re voting for his generosity and concern for the poor. But to me the comments are the best part of Lent Madness, especially this year with our awesome poets! I’m one of those people who would have been unaware of John’s antisemitism and misogyny if I hadn’t read the comments. I was all set to vote for John because I was more impressed with his concern for the poor than with Ephrem’s concern with calling out heretics. Thanks, Ephrem, for this lovely image of being stamped with the image of Christ! Deacon Ephrem gets my vote! Ephrem participated in translating the Hebrew scriptures into Syriac Aramaic, and interpreted these in a manner similar to the Jewish Midrashic approach. It was a a result of his writings that a good number of 4c Jews residing within the region of Syria and Persia were attracted to embrace Christianity. This is in stark contrast to the writings and preaching of bishop Chrysostom who spewed vile anti-semitism from his so called “golden mouth”, encouraging the burning of synagogues and violence toward Jews. What greater heresy is there than the belief that any subset of God’s children are somehow less human or less worthy than others? My vote is against heresy and against bigotry. Adding my voice to the chorus of support for Ephrem. Voted for John Chrysostom and the poor this time around. We could use someone like him to bawl out many in government and the 1% today! Just thanking our Bloggers. What an amazing job you do of telling the stories of our saints! These two summaries were extra-well done and informative, I felt. Neither of these two would be in my Hal of Fame. But John’s acts of charity ring loud for me in these era of political cruelty toward the poor. In spite of some of his rantings against Jews, he actions were honorable and instructive for us. Come on, nobody likes a snitch. St. John Chrysostom for the win. My bracket for this sector is a bust. I voted for Ephrem because he needed it more. Is anyone noticing that the first blog tends to be the winner? Asking for an underdog. P.S. Don’t yell at me. I am not really being snarky; I studied sociology and that kind of statistical gizmo amuses me. Could be it. I also think the more “famous” saint, the more modern, or the more relatable saint tends to be the winner–as when Francis of Assisi won a few years ago. Who doesn’t love St. Francis? But he was up against some amazing people, and I, for one, was disappointed. Obviously, I was in the minority! I too was disappointed. I did buy the St Francis Golden Halo mug. You’re welcome, Tim and Scott. But I now yearn for Julian of Norwich to win the Halo. And I might even be ready to take a “possibly apocryphal but much loved by medieval people” fictional figure into the winner’s circle. Not ready for St Guinefort. Yet. Has Elizabeth of Hungary been up yet? Even if so, she deserves another shot. Her story is all over the Wartburg castle, right along with Luther’s. As a poet myself, I had to cast my vote for Ephrem and the power of language. I do not belive either will get the halo. Both were came from wealth and chose to help the poor and sick. But they neglected there own health something I do nor believe follows the teachings of Christ. Also there is not enough information on either to truly get a good picture. “Sealed by the Holy Spirit in Baptism and marked as Christ’s own forever”, has been a mighty comfort to me from first I heard it. The wounds of my adult son’s death have been reopened in recent months by two untimely deaths of my family members adult children. Their pain and enormous loss is palpable. As I read and pondered the lives of these two saints it began to feel like I had to decide between two TV evangelists. Eventually it struck me. “For Ephrem, to be stamped with the image of Christ was a “beautiful” thing. I received a totally unexpected blessing today with a reminder that my son was marked and sealed as Christ’s own forever. Thank you, Marcus Halley and LM. This is a touching reflection, Judy. I am grateful for your sharing it. It helped me to think differently about this. Judy, thank you for sharing your thoughts, not just about the voting but about your (and your family’s) grief and the comfort you received today. You made me realize that I can keep this in mind as I think of the people I love who have died, whose absences I still feel so deeply. I hold a grudge against the Golden-tongued Antisemite for vanquishing my favorite Margherita di Cortona and have voted accordingly, but in vain. Wait till next round, John ChrysoSTOM; Santa Claus is coming to clean your clock! Nothing but coal for ‘Lil Johnny. Sad. I hated to vote against a deacon, but in these descriptions, Chrysostom seems the more diaconal. The concerns expressed about Chrysostom’s anti-Semitism notwithstanding, his concern for the poor and his personal example win my vote today. Ephrem is also known as Ephrem the Syrian – I’m voting for him as a prayer for Syria. A Harp in the Lentorium! Having come from a St. Vincent de Paul Conference this weekend, celebrating 150 years of caring for the poor and marginalized, John C’s actions reverberated within me. (Not to say he had no flaws! Aren’t most of us ‘blind’ to what some others see so readily? It’s that old beam-in-the-eye syndrome! . . . and he WAS a product of his times. . . but he put his money where his mouth was and shone a golden light on the needs of the poor.) With all his unholy flaws that others usurped and glorified to justify their own prejudices, I still vote for John. Doesn’t a book launch include a tour and book signings? Morning Joe and Starbucks are missing their chance. Not to mention Powells Books, the legendary independent bookstore, which is home to a World Cup Coffee location (which serves locally roasted fair trade coffee, btw). as Ephrem of Edessa. Our congregation was taught Hymn 443 several years ago by our rector at the time, and it has remained a favorite that we sing 3-4 times per year. Thus, as our parish musician, I had to vote for Ephrem. For anyone who loves this hymn or any other poem of Ephrem, it is a real treat to take a look through the book “Ephrem the Syrian: Hymns” (Classics of Western Spirituality). His creativity, especially in the use of paradox, is mind-boggling. The Lamb, bleating as He comes forth. I can not believe Chrysostom (sewer mouth) is even in Lent Madness. With all the wonderful Christian saints (and even some wonderful saints of other faiths) from which to choose why is Hitler’s godfather even here. Do you not know his sermons were translated into German and widely disseminated by the Nazis as a justification for the Holocaust. Read “Adversus Judaeos” (widely available on the web). Compare, for example, Chrysostom’s statements- “that in accordance with the sentiments of the saints I hated both the synagogue and the Jews….demons dwell in the synagogue and also in the souls of the Jews, they are growing fit for slaughter….the Jews are always degenerate because of their odious assassination of Christ. For this, no expiation is possible, no indulgence, no pardon (John Chrysostom, Against the Jews) with Hilter’s “I believe that I am today acting in accordance with the will of the Almighty Creator: by defending myself against the Jew I am fighting for the work of the Lord” (Mein Kampf ). Aquinas, Luther and Marx. However showing that other prominent people were also haters in no way justifies Chrysostom. It seems likely they were inspired by Chrysostom. We know the Nazis were. If we truly believe these help place Chrysostom back in the sewer from whence he came.